Superb shooting performance for moving subjects. Capture elusive subjects at their peak with up to 8 fps continuous shooting1 for approximately 50 RAW images (14-bit lossless compressed). Get your creative world in motion with stunning 4K UHD video and advanced filmmaking features. With Nikon’s Picture Control System, you can select one of eight Picture Controls according to your creative intentions including Picture Control Auto to automatically optimize images to each scene. The D7500 was designed to fuel your creativity all day long. The D7500’s tilting LCD monitor lets you shoot from a wider range of angles with ease, as well as focus and release the shutter by touch when using live view. It makes macro shooting from low-angle positions more convenient, enabling you to operate the camera right next to flowers growing close to the ground. With Nikon’s precision optical viewfinders, you see what the lens sees—without any delay and in real time. This is ideal for sports, action, low light and general shooting scenarios. Perfected over many decades, the optical viewfinder gives you the purest shooting experience possible, with the clearest, brightest and most seamless rendition of the scene playing out in front of you. D7500 employs a deeper, more ergonomic grip designed to help improve stability, eliminate hand and arm fatigue and ensure comfort for all day, handheld shooting with telephoto, tele-zoom or all-in-one NIKKOR lenses. 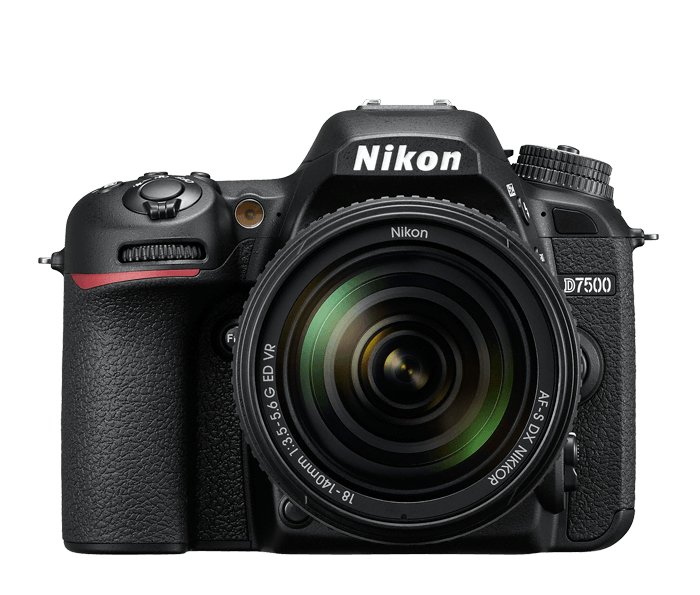 Whether you are an enthusiast or a professional, the D7500’s ergonomics are uncompromising in comfort and operability, giving you that seamless Nikon shooting experience regardless of what you are shooting. Share your most impressive images easily. The D7500 can be constantly connected to a smart device4 via Bluetooth®, with the SnapBridge application installed. 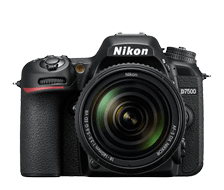 Automatically transfer images taken with the D7500 to your smart device or upload them automatically to Nikon Image Space. Master the D7500’s diverse shooting capabilities. Make your stills or videos more eye-catching with Special Effects like night vision, photo illustration, miniature, selective color and more. Expand your shooting possibilities, even under harsh conditions. D7500’s body employs a lightweight monocoque structure made of carbon fiber composite material, offering durability against shocks. Its design incorporates a deeper grip for more secure and comfortable holding. Comprehensive weather sealing is applied to the camera body to prevent dust and water droplets from damaging the electronics, for added piece of mind. With the D7500’s optimized power management, you can shoot approximately 950 shots6 with the included EN-EL15a battery before you have to worry about swapping it. With competing platforms, you’ll find yourself carrying up to 3 batteries to shoot as many frames as the D7500. The D7500 can help you get a full day’s worth of shooting down to one battery charge. D7500’s shutter unit has been rigorously tested for 150,000 cycles while actually loaded into the camera. It’s also fitted with a shutter monitor function that calculates the duration between front- and rear-curtain movements every time the shutter is released, and automatically corrects any variance. Unlock your creative vision and your camera’s full potential with over 90 NIKKOR lenses—each optimized to deliver stunning results across a variety of applications. 1 Approximate frame rates for a fully charged EN-EL15a Rechargeable Li-ion Battery, using continuous-servo AF, a shutter speed of 1/250 s or faster, and with other settings at default values. 2 Maximum recording duration of 4K UHD time-lapse photography is 3 minutes. 3 Functions in exposure mode A and M only. Operational sound may be picked up when using the internal microphone. External microphone use recommended. 4 Compatible with iPhone® and/or iPad® or smart devices running on the Android™ operating system. 5 D7500 is fully compatible with SB-500, SB-700, SB-910 and SB-5000. 6 Per CIPA standards, with Bluetooth and Wi-Fi turned off.